From my DreamHost Dream Guy -- <3<3 Josh Jones... read all about it. Man if he went gay I would so move to LA in a heartbeat.. and boy do I hate LA! But isn't he just adorable? He is the total package. Totally. So.. here's the direction my Picatrix work is going to take from here... I originally started translating from the Bakhouche French translation from the Latin -- and started on Books 3 and 4 -- because an English translation of the work hadn't been completed and available to the public yet, and I wanted the invocations and practical instructions in English for myself. Now that Chris and John have completed their very usable pre-published edition of Books 1 and 2 I'm not likely to work on that at all. It is so good that I am just going to recommend people try to get a copy of that or wait until the whole shebang is done in a year or so. My work on Books 3 and 4 is going to be contingent on my own practical needs over any desire to just have the whole thing in my hands in English, since I do read French rather decently in itself. I'll have a Latin facsimile manuscript version in my hands soon as well. I rather like the idea of doing invocations in Latin and may transcribe those as is. My focus is going to shift more towards reference material based on Picatrix with a mind to practical use, as well as original artwork inspired by Picatrix for use in talismanic work and examples of actual talismans. I'm no Nigel Jackson mind you, but there is no one right to be a talismanic artist, the important thing is for the image to have affinity to the planet or star or constellation or mansion in question according to our traditional sources. So I've been on a binge lately of Very Expensive But Awesome Wizardly Books. The requisite Wheelock's Latin and Cassell's Latin Dictionary in hardcover. A hardcover review copy of Chris Warnock and JMG's collaboration on Books 1 and 2 of Picatrix. 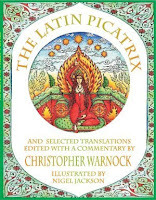 A special-request hardcover copy of Chris Warnock's edition of the Latin Picatrix from Sloane 3679, available from Renaissance Astrology. And last but not least (so far) the upcoming Golden Hoard edition of the Veritable Key of Solomon. Yes I have low resolution images of the original French manuscript from the Wellcome website itself but there is nothing like holding a good book in your hand and I'm very happy with their edition of The Goetia of Dr. Rudd. Still itching my palm are Peterson's Grimorium Verum and the PGM as well as Curse Tablets. And still waiting to fly off my shelf into someone else's waiting hands is my Ouroboros Picatrix Vol 1, nobody seems interested in my asking price so far on eBay, I may see what some local book buyers will offer for it. (From Pseudomonarchia) "Caim is a great president, taking the forme of a thrush, but when he putteth on man's shape, he answereth in burning ashes, carrieng in his hand a most sharpe swoord, he maketh the best disputers, he giveth men the understanding of all birds, of the lowing of bullocks, and barking of dogs, and also of the sound and noise of waters, he answereth best of things to come, he was of the order of angels, and ruleth thirtie legions of divels." I think about this spirit quite often as I study. "Barbatos, a great countie or earle, and also a duke, he appeareth in Signo sagittarii sylvestris, with foure kings, which bring companies and great troopes. He understandeth the singing of birds, the barking of dogs, the lowings of bullocks, and the voice of all living creatures. He detecteth treasures hidden by magicians and inchanters, and is of the order of vertues, which in part beare rule: he knoweth all things past, and to come, and reconcileth freends and powers; and governeth thirtie legions of divels by his authoritie." It should be fairly obvious but Tracking is in fact a divinatory skill in which the Tracker is aware of "all things past, and to come" by the marks left in passing in the environment, that can be taken on many levels, and I strongly believe there is a relationship between Tracking and Astrology as well. As below so above, astronomy and astrology are the tracking of celestial bodies as the Man of Earth tracks humans, animals, the weather, etc. by their impressions and spoor.